Onstream's 30 GB external parallel port drive is the ideal removable storage solution for quick connections to laptops and desktops. The drive accepts 30GB ADR cartridges (sold separately), and with its enhanced parallel port interface boasts native transfer rates up to 0.7 MBps. OnStream produced a great series of backup drives that provided a high capacity at low cost. I've used them for the past five years (both the DI-30 and the SI-50) and they were great. Unfortunately, they filed for bankruptcy in April 2003, and are now completely dismantled. You may still be able to get service, but I wouldn't recommend buying a drive. I've been trying to get some new tapes, and almost no one is carrying them anymore. Great company, it's a shame to see them go. Is OnStream still in Business???? I had an OnStream DI-30 ... Dead now at 6 months old ... no place to get a replacement!!!! This is a great drive. Makes creating and managing backups a snap. Because it will also track multiple iterations of a document over time, you can "back-track" to an earlier version if needed. Top flight performance for the price. However, because the tape drive is treated just like another hard disk, some of your other applications may behave oddly. An example, Cybermedia Uninstaller tries to scan _every_ drive before it will load. If you have a lot of material backed up on your OnStream TBU, Uninstaller will try to scan it. Very, very slowly. (Remeber, the OnStream is about 1/50 the speed of a hard drive. I have a machine on which Uninstaller is now useless because it would take two days to scan the tape.) If you live by Uninstaller, consider a different backup option (or a different removal program, CleanSweep is very good). Sorry, I have not tested this TBU with other removal software (e.g. Norton Uninstall, Remove-It, CleanSweep). After having been disappointed with earlier consumer-grade tape backup solutions (QIC-80, QIC-WIDE, etc. ), I am extremely pleased with the Onstream ADR's convenience, reliability, and feature set. The drive's ADR cartridge holds 15GB uncompressed/30GB uncompressed. Unlike other cartridges I have used, the drive and its cartridges have withstood six months of daily use. Speed is acceptable for a consumer using the EIDE drive; I get between 12-25mb per minute, depending on what other applications are running. The SCSI drives have approximately double this speed. The software is terrific. It constructs a database that treats the tape cartridge as a hard disk -- you can drag-and-drop from the cartridge to the hard disk and can even run programs from tape (albeit slowly, although it is quick enough to playback MPEG, RealMedia, and some other multimedia files). The database feature also keeps track of each version of each file backed up and allows you to select exactly which version you want to restore. 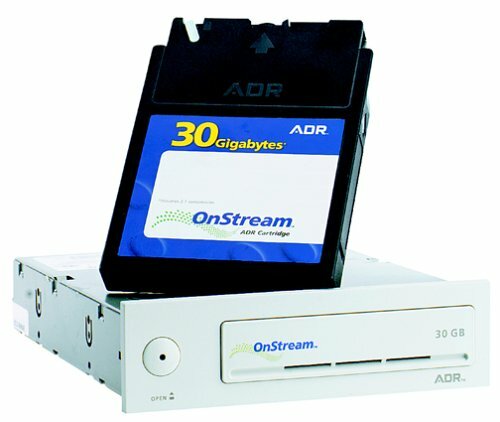 In addition to the drag-and-drop operation, the Onstream comes with excellent traditional backup and restore software. It handles timed backups very well, and will shut down windows if you want it to bakcup every evening but don't want to keep your computer on all night.